When I can, during the off season, I love to try to test different things to see if what the scientist say and if what the marketers say is true. 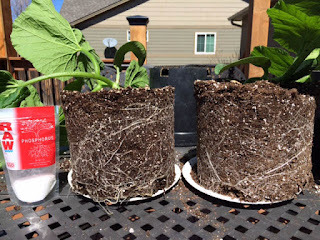 I mentioned a few weeks ago that I was going to test to see if adding a very little RAW Phosphorous to the giant pumpkin plants would increase root mass as advertised. I should note that if these were plants that I was going to actually grow pumpkins on I would have done things a little differently. 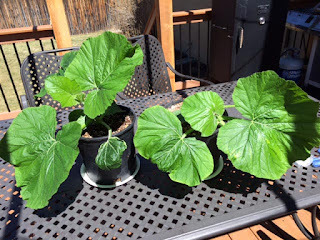 I would have gave the phosphorous to the plants once they were in the ground rather than in the pots and I would have got these plants in the ground with hoop houses covering them about 4 or 5 days earlier. I wouldn't say these tests were scientific, but adequate enough to find some results. 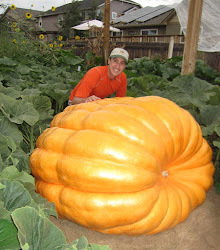 The most definitive results that I have is not about the RAW Phosphorous but on the 747 Johnson seed. Both of the plants pictured below are from the 747 I did not start them in ideal conditions. Temperatures were never over 71 degrees and I didn't give them much care. However, they were aggressive growers with big leaves for only being 3 weeks old, as you can see. The root systems on both plants were also above ordinary. The science says that RAW Phosphorous will produce a 15% larger roots system. I gave both plants the same amount of water and both where in the same environment. Looking at the pictures below I would say visually it looks like the 747 that was given the RAW Phosphorous on the left has a slightly bigger root system on it. More tests would be needed, but it looks like 15% could be possible. I wish I had taken the plants out of their pots about a week earlier when the roots weren't quite as developed. It would have made it a little easier to visually see the differences in the root mass. It should be noted, that if you look at the pictures of the plant when I gave it the phosphorous I purposely gave the plant that was smaller than the one that didn't get phosphorous and it clearly caught up to the other plant.